I have an Bausch & Lomb optical Stereo-Zoom (SZ4) microscope which is a great instrument and not a luxury when you do a lot of SMD prototyping and repairs. The light solution for this was a simple piece of white LED strip powered from a 12V adapter, worked well for over 6 years and I thought an upgrade to this will make a nice weekend project. To really make this nice and portable it had to be very compact, wireless power from a rechargeable Lithium-Polymer battery. But how can this be powered from 3-4V when the LED strips require 12V? Watch the details in the video below, along with a demo of laser-cut SMD stencils and complete hand assembly and test of the new light ring. The design files are over at Github. Are you planning to make one or add more features? Did you learn something new from this video? Have a question or other suggestions? Let me know in the comments! Do you have a laser cutter? Do you need an emergency shipping box? The USPS Priority Small Flat Rate Box has a nice template that can produce an easy to cut resizable box from the endless supply of throw-away cardboard boxes from your online Prime and other shopping adventures. I traced a curve after a photo of such a box laid flat on the floor, made some adjustments and ended up with a digital template that can be resized and adjusted to your needs. Makes for some recycled cardboard shipping boxes for those who think they might save a tree or need a quick sturdy box to ship something and don’t have one handy. Maybe this comes useful to someone. Each laser cutter is different and you will need to experiment with cutting power and speed. Mine is a 60W CO2 laser and the settings I used are 75mm/s with 60% power for cuts and 15% for fold lines.The fold lines are merely scores in the cardboard that help with making easy straight folds. Depending on your laser bed’s size you may enlarge and make larger boxes or put them side by side like a jigsaw puzzle as seen in the first photo. If you make PCBs and have any SMT components you likely need an SMT stencil to apply solder paste and then bake everything in an oven to reflow the paste. I’ve previously written an extensive tutorial on how to etch metal stencils from soda can material, still very popular, dirt cheap to make and pretty quick once you get a feel for it – it produces very high and extremely durable metal stencils. I’ve been literally using chemically etched soda can stencils thousands of times making Moteinos before I moved to stainless steel commercial stencils. Bulk made enclosures are useful when you just want basic underwear on your Pi but what if you need to put something else in there and it won’t fit? I’ve built a Pi enclosure for my home automation gateway before but it was just 3 layers of acrylic to hold everything together, turned out nice. 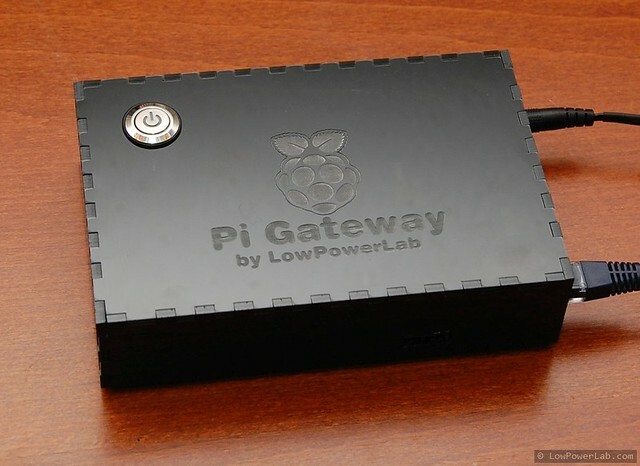 In this post I will show another example enclosure for a Pi gateway. I am finishing up a separate project where I needed to put a Pi gateway in an elegant enclosure along with an ATXRaspi+power button, and a Moteino. This guide can be used as a guide to build a RaspberryPi+ATXRaspi+Moteino setup that can all live together in a nice box to serve as an internet gateway to your Moteino or other wireless Internet Of Things network. I will show you how I made the case and the steps I took to avoid wasting material while adjusting the cutouts. I will include the corel and DXF files that I used to lasercut the case. I have a 60W laser cutter imported from china, and that makes for a very nice prototyping tool to cut and engrave the boxes, but they are becoming widely available at hacker spaces and workshops all around. 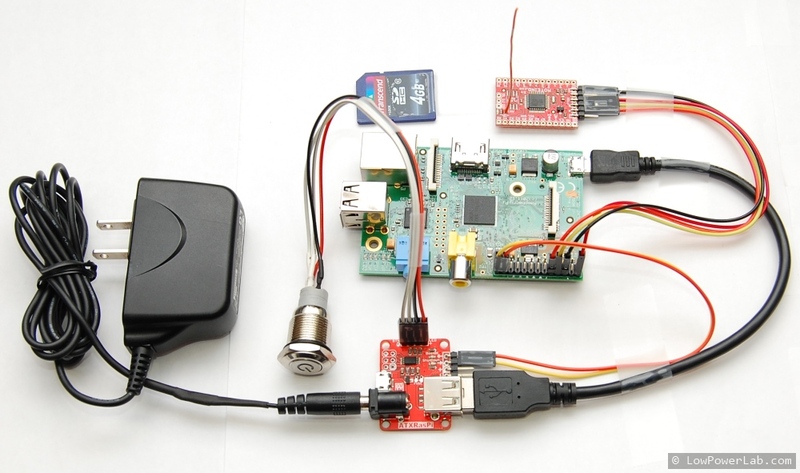 ATXRaspi is great for enhancing your Pi with a power button that will gracefully shut down your Pi without the need to login to do that. 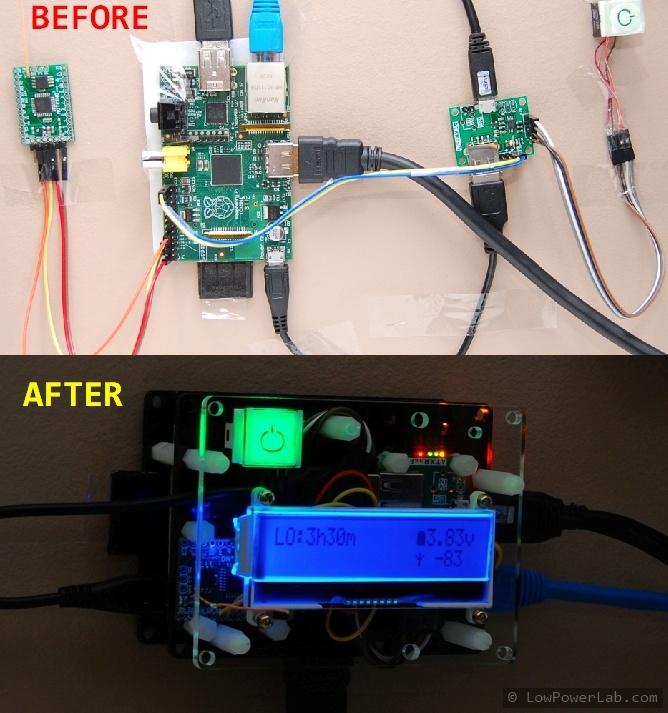 I’ve been running my Pi like that for at least a year. But I felt like I needed something new, more powerful. 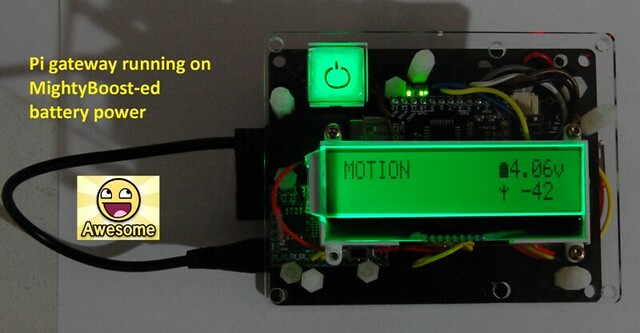 Enter MightyBoost – a multi purpose PSU that can supply the power a Pi needs, and also be controllable by a Moteino (including wirelessly controllable if needed) such that it would duplicate the functionality of ATXRaspi. And most importantly to be able to run it on battery backup in case power is lost, to avoid SD card corruption and downtime. Also it can monitor the battery (via Moteino A7) and shutdown the Pi in time before the battery runs out, as a last resort. Without a Moteino it can be used as a general purpose 5V boost-from-lipo power supply, that can also charge your tablet/iPhone/droid/etc.